Reis Effendi. Minister for Foreign affairs. Ottoman Empire. Home » Reis Effendi. Minister for Foreign affairs. Ottoman Empire. Reis Effendi. Minister for Foreign affairs. THE office of Reis Effendi unites what in Europe would be called Secretary at State, high Chancellor of the Empire, and Minister for Foreign affairs. From the great extent and importance of his employment this officer is reckoned one of the first in the Turkish empire. Every order of the Porte, which is not immediately connected with the finances, or military operations, passes through his hands, and must have his signature. He negociates and confers with all the foreign ministers who are at Constantinople. In fact, every thing relative to foreign affairs, as well as all the administration of the interior, passes through the hands of the Reis Effendi. But even with all this power and business he is obliged to consult the Grand Vizier, and to follow his directions. If, however, he is thus obliged to be obedient to the orders of the Vizier, the Reis Effendi by these means transfers the responsibility, and consequently the danger, of every act to that officer. Printed by Howlett and Brimmer. 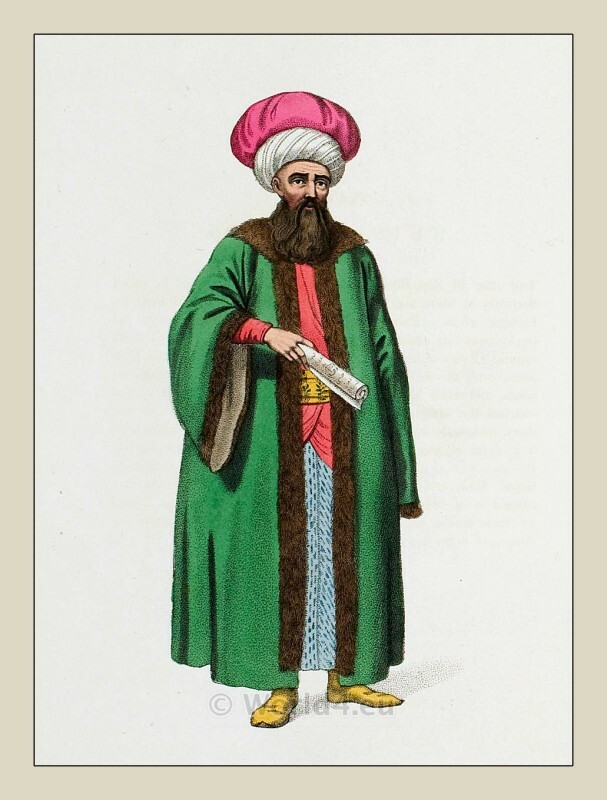 This entry was posted in 1804, 19th Century, Ottoman Empire, Turkey Costumes and tagged Ottoman Empire costumes, Traditional Turkey Costumes on 11/30/13 by world4.